Here's a breakdown of the 12 races where two Trump-aligned outside groups are planning to spend a combined $12.5 million after Labor Day. 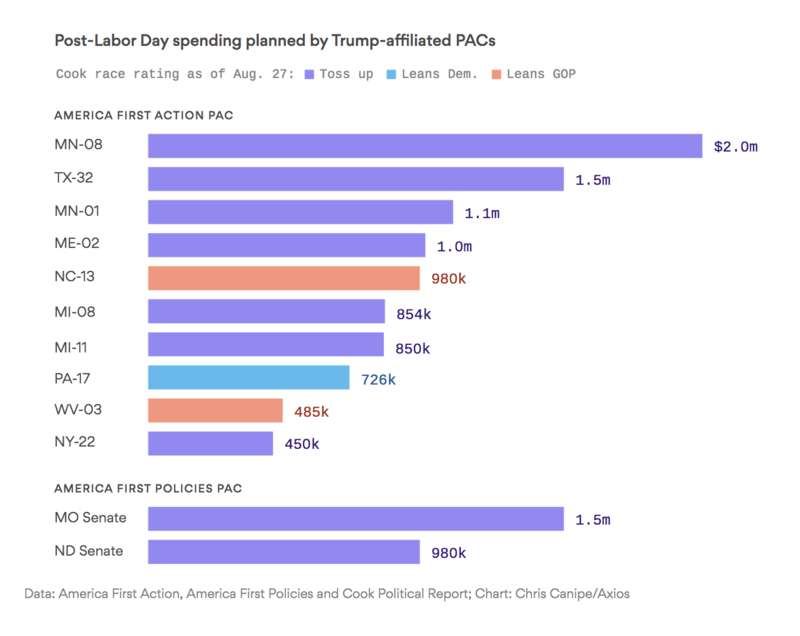 Why it matters: This is the first round of planned spending from the two GOP groups, and it shows which races Republicans are most worried about heading into November. Between the lines: All of these races are places where Trump won in 2016. Both Minnesota races are open seats, which are historically easier to flip. The most surprising investment is the nearly $1 million in North Carolina's 13th district, because it's favorable to Republicans and held by GOP Rep. Ted Budd. He's been out-raised by his Democratic challenger. Another outside group, the Congressional Leadership Fund, is investing heavily in 25 races — only 5 of which overlap with American First Action. The money will be spent on TV, digital, and radio ads. “These are not easy races,” Brian Walsh, president of America First Action, said in a statement. “They represent some of the most difficult in the nation.” But the groups hope their financial investment will help Republicans hold the House and expand their majority in the Senate.